" Miniature Doll - Swiss Native Costume"
(589)Miniature Doll - Swiss Native Costume.-Condition: Excellent.This beautiful little doll stands 5 1/2" tall. 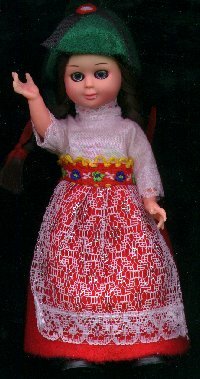 She is dressed in the Native Costume of Switzerland, and is made of hard plastic with moveable head, arms, and legs. Her eyes open and close when she is moved. She is still in her original soft plastic case. Price: $4.00 + shipping.